Qualcomm officially launched the Snapdragon 845 chipset that will power high-end Android flagship devices in 2018. It is built on 2nd-gen 10nm process and allows 25-30% speed, 30% more power-efficiency and three times faster AI processing. The next-generation mobile platform that will power the 2018 Android flagship devices is here. 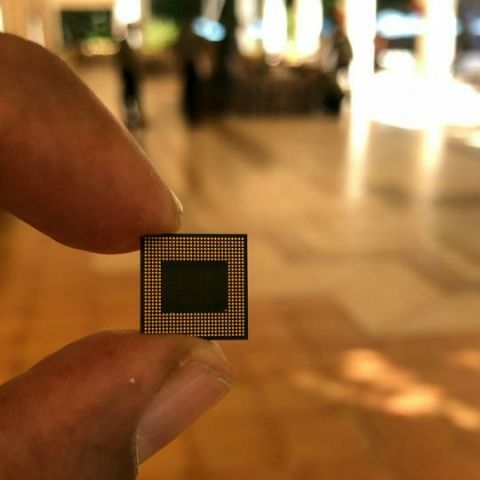 Qualcomm unravelled the details of the Snapdragon 845, the latest flagship mobile CPU. The focus is on connectivity, security, AI, immersion and of course, performance. The Snapdragon 845 will provide a speed bump of about 25 to 30 percent. It is also 30 percent more power efficient than the Snapdragon 835. It will have a similar octa-core architecture with four performance cores to handle high-end tasks that require more power and four efficiency cores that will run lighter taskes that require less energy. The performance cores can clock upto 2.8GHz while the efficiency cores and go upto 1.8GHz. As revealed earlier, the chipset will have the same 10nm footprint as the Snapdragon 835 but new improved 2nd generation 10nmLPT architecture will introduce new features like 4K Ultra HDR video capture at 60fps and three time faster AI processing. There is also a 3MB system cache and for the first time, it can be used by all the components including the GPU, ISP, etc. to use it to achieve higher efficency. The previous L2 cache was only restriced to the CPU in the Snapdragon 835. 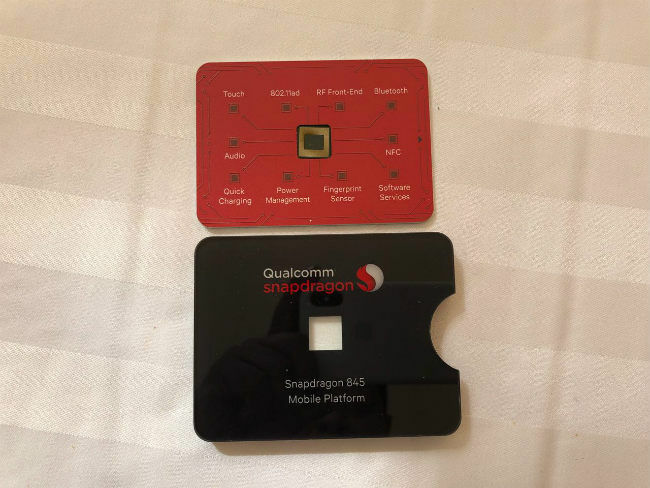 The Snapdragon 845 features Kryo 385 cores redesigned from the ground up as well as a newly designed Adreno 630 GPU. The changes to the GPU will provide a 30 percent boost in graphics with 30 percent more power-efficiency. Devices will be able to record 4K UHD Premium video for upto four hours continously. The Snapdragon 845 platform features a new Spectra 280 image signal processor (ISP) and third-generation Hexagon 685 digital signal processor (DSP) that can capture and render the world around in high definition. Qualcomm said the ISP will allow "Ultra HD Premium" video capture at 60 frames per second. The ISP can capture more colour volume than ever before, meaning nuances in image quality will likely increase. The Snapdragon 845 can take portrait shots with a single camera, much like the Google Pixel 2. The Spectra 280 ISP will also expand the colour gamut from Rec709 to Rec2020 and move from 8-bit to 10-bit HDR. The ISP will use multi-frame noise reduction backed by algorithms to improve low light performance. It will use 60 16-megapixel images per second to improve noise reduction. Additionally, the Snapdragon 845 allow a new kind of image stabilisation - Motion Compensated Temporal Filtering, that will compare a frame in a video to the previous frames to provide a better outline of an object. 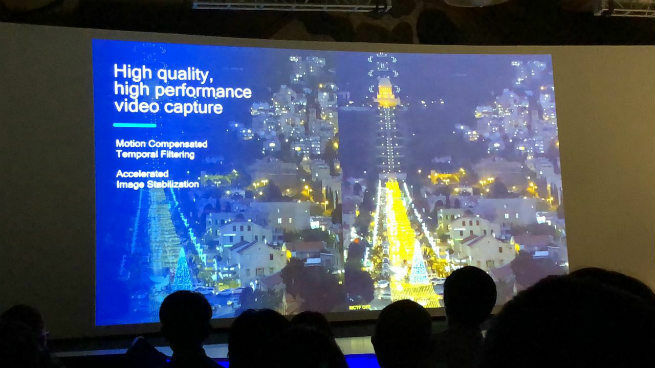 The ISP will also offer slomo video capture at 480fps at 720p, selective motion capture, "deep" portrait mode and more depth sensing features. 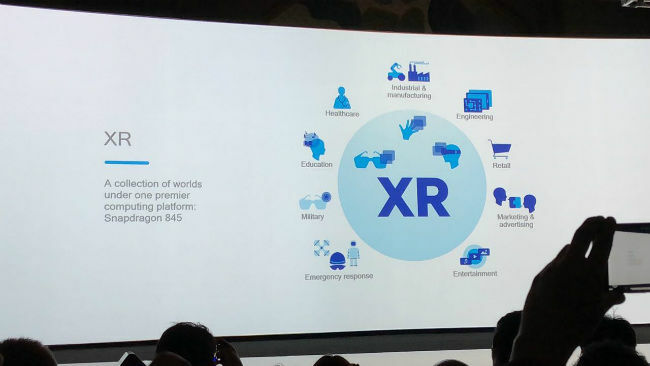 The Snapdragon 845 will also usher in the era of XR or Xtended Reality that will allow world-scale tracking, much like what the HTC Vive VR headset already does. You can move around a room freely within your virtual environment. The biggest improvement is in the chipset's AI capabilities. This is the third generation mobile AI platform and the focus is on core optimisations. 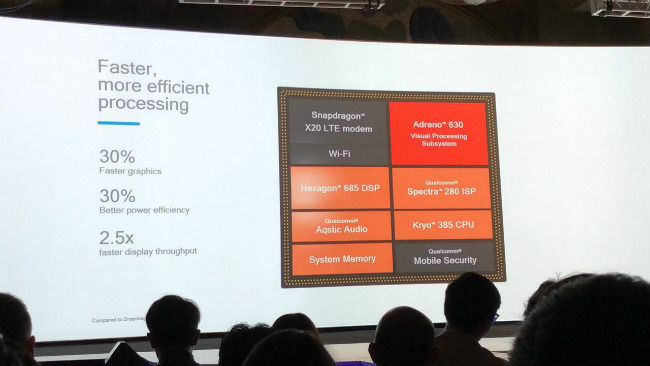 The Snapdragon 845 will assign AI tasks to different cores based on the type of power needed, with a three times boost to AI speed. 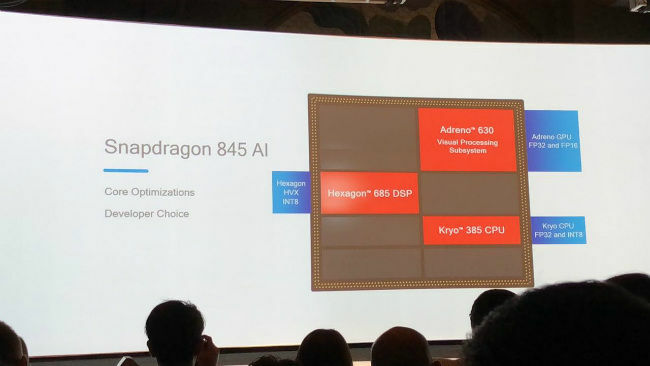 Either the Kyro CPU, the Adreno GPU or the Hexagon DSP, developers can choose the components it wants its AI to run on. For the first time, the Snapdragon 845 will house a "Secure Processing Unit". It will be like a secure island inside a chipset with its own processor, memory, power and random number generator to defend against attacks. The SPU will house and process biometric information like face recognition data, voice and iris based data. 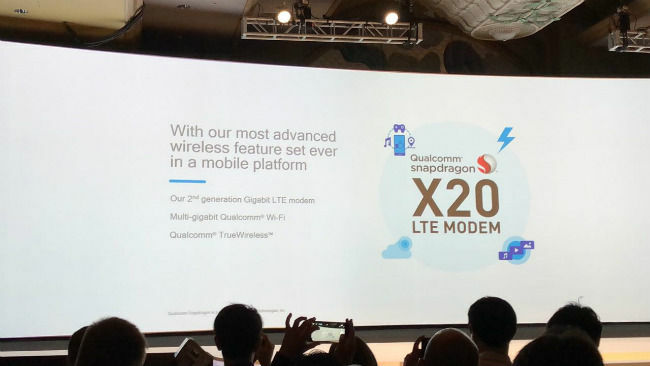 As for connectivity, the Snapdragon 845 will feature the X20 LTE modem, Qualcomm's second-generation gigagit LTE modem that will allow a 20 percent boost in peak and real-world speeds over the Snapdragon 835's X16 modem. Ideally, you will be able to download a two hour HD movie in two minutes over wireless fiber. 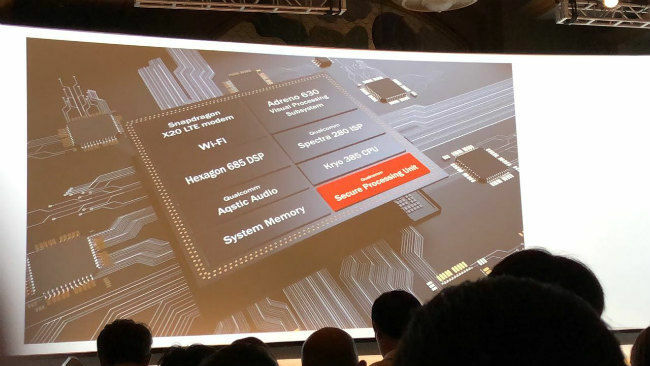 The Snapdragon 845 also introduced advanced Bluetooth capabilties where the chipset can broadcast HD music or live audio to multiple devices. It will also cut down power consumption by wireless earbuds by 50 percent. The Snapdragon 845 looks promising as the next-gen mobile platform for Android devices. AI is most definitely at the center of it all with the new chipset becoming more aggressive in distributing AI-related tasks across all modules to achieve higher efficiency. The focus is also on improved security throug the Secure Processing Unit along with improved conectivity speeds. The first phones powered by the Snapdragon 845 chipset will start appearing by early 2018, Qualcomm said. based on performance and battery consumption ?? ?